We’re back with our continued look at some of the most interesting Ace Doubles. Last time we discussed Eric Frank Russell’s first Ace release, his 1954 novel Sentinels of Space (with a brief aside to look at his 1958 paperback collection from Berkley, Men, Martians, and Machines.) So I thought it apropos to examine his first Ace Double pair: Six Worlds Yonder / The Space Willies, published in 1958. One thing’s certain about the exploration of outer space — there’s not going to be two worlds alike! In this new collection of interstellar explorers, the fertile and original mind of Eric Frank Russell presents a half-dozen of the more extraordinary possibilities. Every story is different, every world is unique, and every adventure is science-fiction at its best. 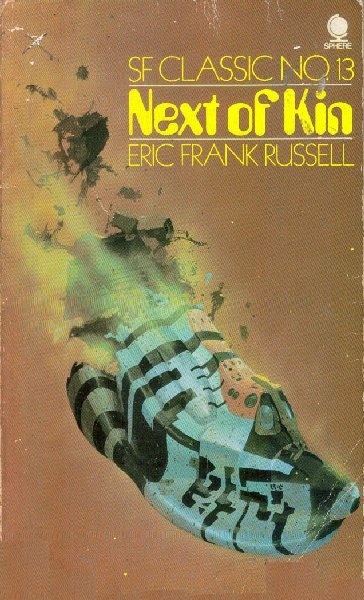 Russell’s stories were frequently more whimsical than most others depicting the grim business of interstellar exploration in 1950s SF digests. I think perhaps Bud Webster described Russell’s style best in his book Past Masters, in his appreciation of the stories in Men, Martians and Machines. 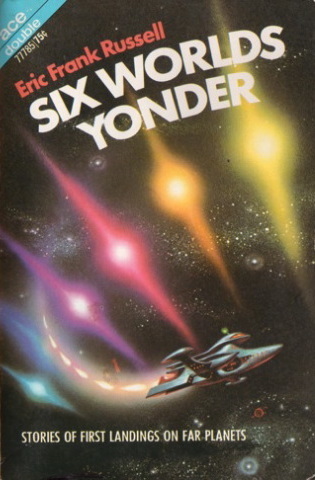 On the flip side of Six Worlds Yonder is a complete novel: The Space Willies, the tale of John Leeming, a military maverick who’s tasked with waging a one-man psychological warfare campaign against a hostile alien race in the midst of a deadly interstellar war with Earth. This was its first publication — but by no means its last. There was a common understanding in the Space Navy that scout-pilots were a breed apart — cocksure, reckless, and slightly nuts. But it was also understood that when a really dangerous job had to be done, a scout-pilot was the man to do it. So for John Leeming, a couple of months of dodging death in a one-man ship, zipping in and out of the enemy Combine’s rearguard, was just another one of those jobs. And there was no man in the Universe more surprised than Leeming when his heretofore indestructible ship just gave up the ghost smack in the middle of a Combine-held prison planet! It was then that the spirit of the Scout Corps had its chance to shine. 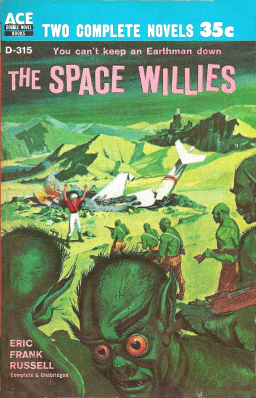 With self-confidence as his only weapon, Leeming had only two choices: give in to the enemy and be captured… or quick-talk them into a real case of THE SPACE WILLIES! Russell published one additional book with Ace between Sentinels of Space and Six Worlds Yonder: his classic novel of alien invasion, Three to Conquer (1957). 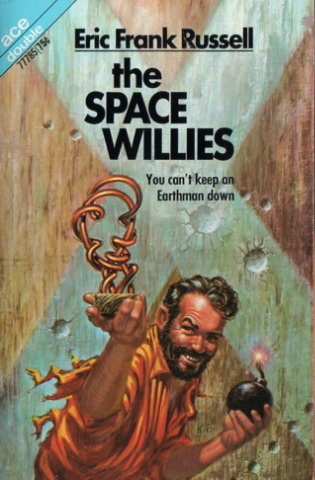 Six Worlds Yonder / The Space Willies was reprinted once, in 1971, with a new set of covers by the great Kelly Freas. That was the last time Six Worlds Yonder saw print, but The Space Willies has been reprinted over a dozen times — though not with that title. It was expanded into a full-length novel in 1959 and appeared under the title Next of Kin in hardcover from British publisher Dennis Dobson. Under that name it’s remained in print, off and on, over the past five decades, and indeed is still in print today. 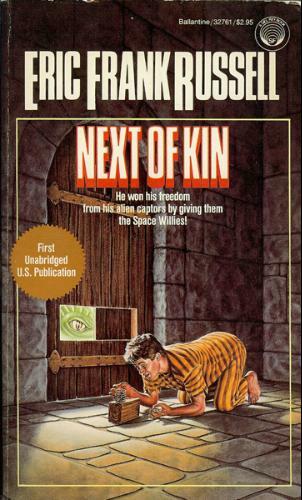 Here’s the fresh set of Kelly Freas covers for the 1971 reprint. I find it interesting that both books kept their tag lines from the 1958 versions. And here’s a sample of the paperback versions of Next of Kin over the decades. That’s the cover of Sphere Science Fiction Classics #13 from 1973 on the left (art by Chris Foss); followed by the April 1986 Del Rey / Ballantine edition (cover by Barclay Shaw); the July 1989 Mandarin (cover by Angus McKie); and finally the 2002 Gollancz SF Collectors’ Edition (art by Chris Moore). 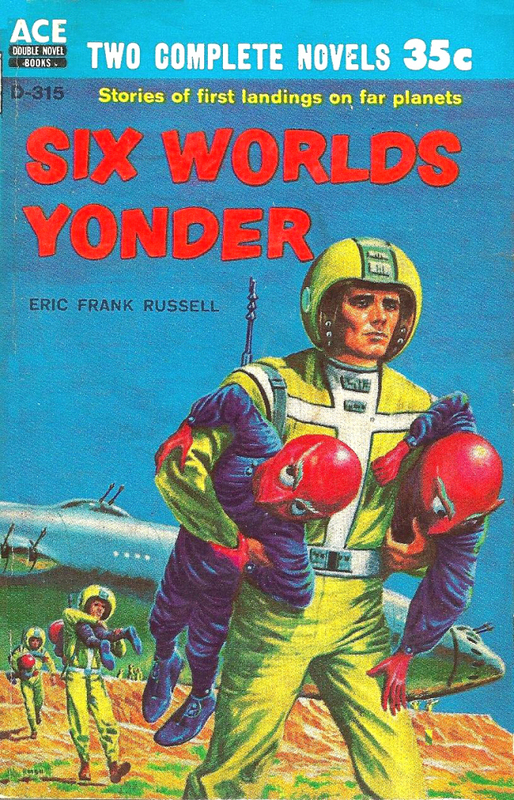 Six Worlds Yonder / The Space Willies was published by Ace Books in 1958. It is 128 + 131 pages, priced at 35 cents. 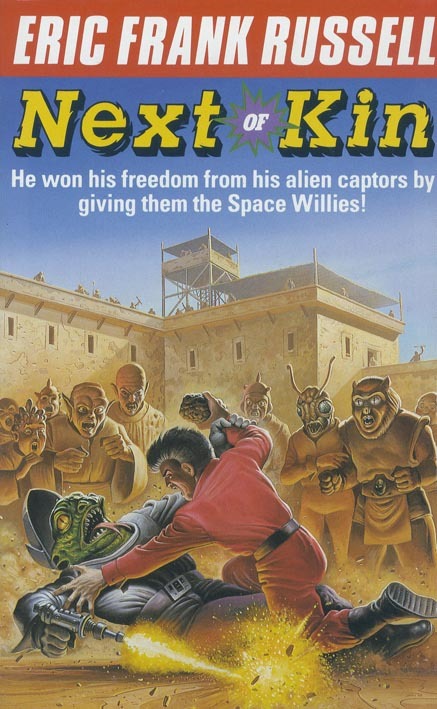 Both covers are by Ed Emshwiller.